Birdman is the second studio album and major label debut by American rapper Baby. It was released on November 26, 2002, by Cash Money Records. The album was supported by three singles: "What Happened to That Boy" featuring Clipse, "Baby You Can Do It" featuring Toni Braxton, and "Do That..." featuring Puff Daddy. In 2003, the album became a certified gold by the Recording Industry Association of America (RIAA), for the shipments of 500,000 copies in the United States. 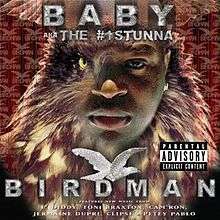 ↑ "Baby :: Birdman :: Cash Money Records/Universal". Rapreviews.com. December 10, 2002. Retrieved January 16, 2012.